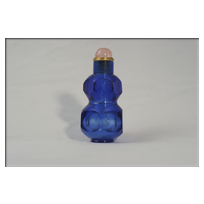 Transparent sapphire-blue glass, double-gourd form with a cylindrical neck, wide mouth, flat lip and protruding, flat circular foot; both upper and lower bulbs faceted with a series of offset panels with straight vertical edges and bulging horizontal ones. Particularly unusual is the faceting on the gourd form, as the facets of the upper and lower bulbs are offset. Other two similar bottles have been recorded so far.